“Elsa was 4 months old when she first came to Dr. Collins. I was at my wits end with different diagnoses of Colic, reflux, gastro intestinal problems. She wouldn’t eat or sleep and neither was anyone else. 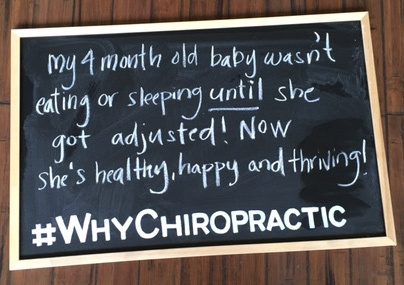 I asked a friend what she would do and after working with one of Dr. Collins’ colleagues she suggested Chiropractic. I thought it was a little crazy but after speaking with him and seeing him (the next day) I was convinced. She was a different baby after the first visit!!!! It was amazing. He explained that possibly she had a vertebrae in her neck out, caused by the traumatic emergency c-section. I don’t know the cause of the trauma or care to speculate, but this has changed our lives!! My son also came to see him (boys get injured often) and it has helped with his eczema as well as other allergies he has suffered in his short 7 years. We continued to see him regularly for about a year and I am so thankful for the progress and healing I have witnessed. My pediatrician has no explanation as to why this has helped my kids so much, but I will tell anyone who will listen that this works.